Find here the answers to most questions concerning Math Mammoth Blue series (the topical worktexts). For starters, the video below explains a brief overview (basics) of these books. 1. Is the Blue series a complete curriculum? 3. Would the Blue Series cover the same information a	s the Golden Series grade-level sets? 4. Are tests included in the Blue Series books? 5. Do all the Blue Series books come with answer keys? something to explain how to do the problem? 7a. Can I buy the Blue Series books as hardcopies (print versions)? 7b. Can we buy the downloads and then take them to a Kinko's type place to have the book printed up and bound nicely? 7c. I hesitate to buy MM because I can't print in color. Any suggestions? 8. In which order should I study the Blue Series books? 9. I'm confused and at a loss as to where to start my kids. Do you have placement tests? 10. What is the copyright notice or license when using these books? most pages don't have any word problems. 12. Does it work on a Mac, Linux computer, or Chromebook? 13. Can the PDF be filled in on the computer or tablet device (iPad or similar)? The Blue Series books have not been written to be a complete curriculum as such. 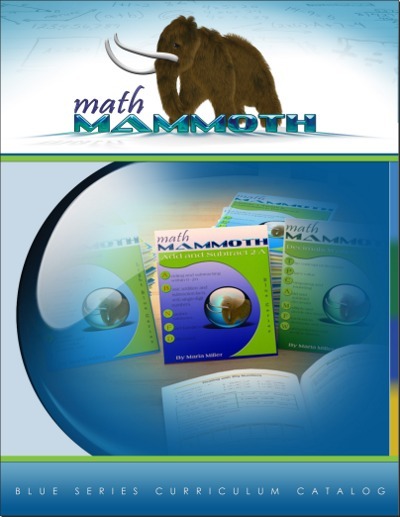 Math Mammoth Light Blue series is the complete curriculum. The Blue Series does not contain tests or cumulative reviews, nor is it organized to go by grade levels. However, it is possible to use the Blue Series books and "piece together" a math curriculum. This will cover all the necessary topics for grades 1-7. Please keep in mind that many books in the Blue Series cover material for several grade levels in one book. The series is NOT organized exactly by grade levels. Generally, the Blue Series books contain much more, because they contain the explanations of the concepts. The Golden Series books are worksheets (problems) only. No. If you'd like to have tests, you can get them by purchasing the Math Mammoth Review Workbooks bundle. 5. Do all the Blue Series worktexts come with answer keys? Yes. In the Blue Series books, the answers are appended to the main worktext. 6. Does the Blue Series come with a teacher manual or at least have something to explain how to do the problem? The explanations of the concepts are right there in the Blue Series worktexts. There are no separate teacher manuals. Please look at the sample pages on this page: Math Mammoth Fractions 1. The lessons generally start out with the explanations and then continue with the problems. With the fraction lessons, sometimes it asks the student to try something first, such as adding something or thinking about some particular problem, and then goes on to explain it. 7a. Can I buy the books as hardcopies (printed versions)? Yes. The Blue Series books are available as printed books through Lulu.com's storefront for Math Mammoth. At each book's webpage you will find a direct link to the corresponding printed version at Lulu. 7b. Can we buy the downloads and then take them to a Kinko's or Staples type place to have the book printed up and bound nicely? Yes. The copyright notice that is printed on page 2 specifically allows the person who purchases the book(s) to make copies — whether by Kinko's or their own printer — to his or her students, but not to other teacher's students. You can also use online printing services such as Mimeo.com, Bestvaluecopy.com, or The Homeschool Printing Company (they have the best pricing I've seen). 1) Print in b&w, but let the child color the boxes the problems are in, using crayons. 2) Utilize the online games recommended in the notes for each chapter for the "color" (so to speak). It works for some! Please see my suggestion for the order of study for the Blue Series books . I do not have placement tests specifically for the Blue Series. However, I have written Blue Series placement advice concerning the various addition, subtraction, multiplication & division books in the Blue Series. You can also use the placement tests for the Light Blue series. Once you have the results from the test, you can email them to me, and I can help you pick books from the Blue Series that would best suit your needs. School licensing or other similar situations: please ask. Copying permission: Permission IS granted to reproduce this material to be used with one (1) teacher's students by virtue of the purchase of this book. In other words, one (1) teacher MAY make copies of these worksheets to be used with his/her students. Permission is not given to reproduce the material for resale. Making the file(s) available on any website for the purpose of sharing is strictly prohibited. If you have other needs, such as licensing for a school or tutoring center, contact the author at www.MathMammoth.com/contact.php. 11. How many word problems are in your materials? From the samples it seems most pages don't have any word problems. I feel I have put lots of word problems into my Blue Series books. They tend to be on the last page of a lesson, and not on the first page of the lesson (the lessons are typically 2-4 pages long) - and for the samples, I usually tend to use the first page of a particular lesson since it shows how the concept is taught. So, that is why the samples do not really show many of the word problems. Yes. The actual files you get (whether from a download or on a CD) are PDF or html files so Math Mammoth is compatible with Mac, Linux, Chromebook, and any other operating system where you can open PDF files. However, you may need to install Adobe Acrobat Reader to view the PDF files correctly. For example, I've had some customers tell me that Mac's native PDF viewer shows black boxes in the files, or that many of the graphics are missing. Similarly in Linux, some images will likely be missing or messed up if you use other PDF viewers. I don't at this time have experience or feedback from Chromebook users. Please note that the bonus software "Soft-Pak" is Windows software only. However, Soft-Pak is not a part of the actual curriculum and is not needed when using Math Mammoth — it is only an additional bonus. Yes, it can. The PDF files are enabled for annotating. This means that the student can fill in the Math Mammoth PDF files on a computer (PC or Mac) or on a tablet device. Use version 9 or greater of Adobe Reader. It has the "add text" and drawing (annotation) tools. This short video below explains how to do it using Adobe Reader version DC. In earlier versions of Adober Reader (such as 9, 10, and 11), the "add text comment" tool looks like in this image. For iPad, there exist several PDF apps that have annotating tools and work well for Math Mammoth files: PDF Expert ($9.99), Goodreader ($2.99), iAnnotatePDF ($9.99). You can add text, lines, and shapes, or use a stylus to write. The apps neu.AnnotatePDF ($1.99) and Notability ($2.99) work also, but are not as user-friendly as the other three. For Android devices, you might check out Xodo PDF Reader & editor.